Some lunatic wasted an All-Pro vote on Andre Carter!!! I am always fascinated by the NFL AP All-Pro teams for selfish reasons. I play a game called Action PC football, a pc based head to head game where you manage a full NFL roster. All-Pro voting is reflected in the ACtion PC player’s ratings when they are published every March (for the previous NFL season), so I use the All-Pro voting as my guide for high-end trade valuations. This makes the total voting that bit more interesting, as the people who finish third and fourth become players I suddenly find extremely interesting. I did like some recognition being given to certain non-household names. This includes the likes of Bengals offensive tackle Andrew Whitworth, ILB David Harris of the J-E-T-S and Texans safety Bernard Pollard. I just question the sanity of the person who voted for the Redskins DE Andre Carter. 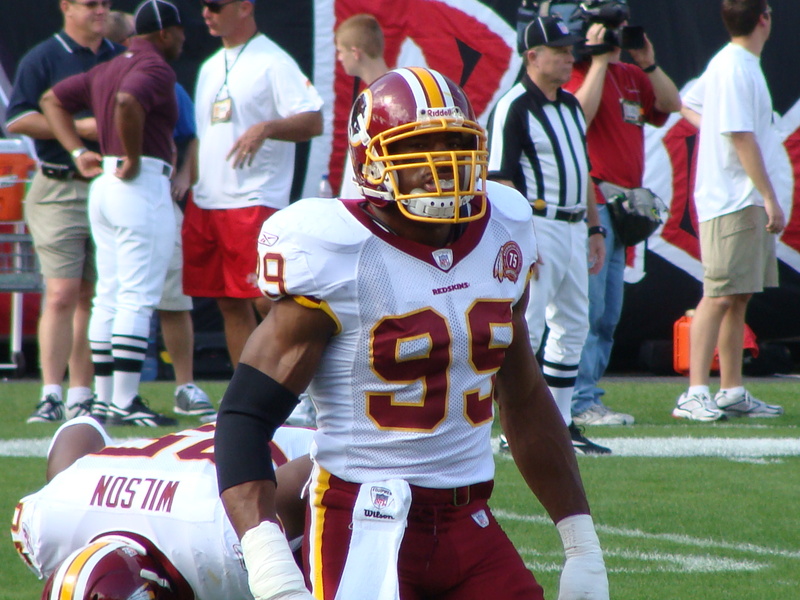 The Redskins D can’t tackle for toffee (apart from London Fletcher) and the only reason Carter got the sacks he did in 09 was because of the extended time the defense spent on the field. Peyton Manning, Indianapolis, 36½; Drew Brees, New Orleans, 12½; Philip Rivers, San Diego, 1. Chris Johnson, Tennessee, 50; Adrian Peterson, Minnesota, 17; Ray Rice, Baltimore, 12; Steven Jackson, St. Louis, 9;Maurice Jones-Drew, Jacksonville, 6; Thomas Jones, NY Jets, 3; DeAngelo Williams, Carolina, 1. Leonard Weaver, Philadelphia, 24; Le’Ron McClain, Baltimore, 14; Lousaka Polite, Miami, 9; Lawrence Vickers, Cleveland, 1; Tony Richardson, NY Jets, 1. Dallas Clark, Indianapolis, 25½; Antonio Gates, San Diego, 10½; Vernon Davis, San Francisco, 9; Jason Witten, Dallas, 4; Heath Miller, Pittsburgh, 1. Andre Johnson, Houston, 44; Wes Welker, New England, 20; Reggie Wayne, Indianapolis, 12; Larry Fitzgerald, Arizona, 8; DeSean Jackson, Philadelphia, 6; Miles Austin, Dallas, 6; Vincent Jackson, San Diego, 2; Brandon Marshall, Denver, 2. Ryan Clady, Denver, 30; Joe Thomas, Cleveland, 18; Michael Roos, Tennessee, 12; Jake Long, Miami, 12; Jason Peters, Philadelphia, 5; Jon Stinchcomb, New Orleans, 5; Bryant McKinnie, Minnesota, 4; Michael Oher, Baltimore, 4; David Stewart, Tennessee, 3; Vernon Carey, Miami, 2; Andrew Whitworth, Cincinnati, 2; D’Brickashaw Ferguson, NY Jets, 2; Marcus McNeill, San Diego, 1; Willie Colon, Pittsburgh, 1. Steve Hutchinson, Minnesota, 31; Jahri Evans, New Orleans, 28; Logan Mankins, New England, 12; Kris Dielman, San Diego, 9; Alan Faneca, NY Jets, 7; Chris Snee, NY Giants, 5; Leonard Davis, Dallas, 4; Carl Nicks, New Orleans, 3. Brandon Moore, NY Jets, 1. Nick Mangold, NY Jets, 31; Andre Gurode, Dallas, 9; Jeff Saturday, Indianapolis, 8; Shaun O’Hara, NY Giants, 2. Nate Kaeding, San Diego, 27; David Akers, Philadelphia, 11; Sebastian Janikowski, Oakland, 8; Rob Bironas, Tennessee, 1; Stephen Gostkowski, New England, 1; Jeff Reed, Pittsburgh, 1; Olindo Mare, Seattle, 1. Joshua Cribbs, Cleveland, 45½; DeSean Jackson, Philadelphia, 3½; Percy Harvin, Minnesota, 1. Jared Allen, Minnesota, 45; Dwight Freeney, Indianapolis, 36; Trent Cole, Philadelphia, 9; Julius Peppers, Carolina, 6; Robert Mathis, Indianapolis, 1; Andre Carter, Washington, 1; Randy Starks, Miami, 1; Will Smith, New Orleans, 1. Jay Ratliff, Dallas, 29; Kevin Williams, Minnesota, 24; Darnell Dockett, Arizona, 23; Haloti Ngata, Baltimore, 14; Vince Wilfork, New England, 6; Pat Williams, Minnesota, 1; Casey Hampton, Pittsburgh, 1; Tony Brown, Tennessee, 1; Cullen Jenkins, Green Bay, 1. Elvis Dumervil, Denver, 46; DaMarcus Ware, Dallas, 37; Brian Cushing, Houston, 5; LaMarr Woodley, Pittsburgh, 4; James Harrison, Pittsburgh, 3; Lance Briggs, Chicago, 3; Anthony Spencer, Dallas, 1; Shaun Phillips, San Diego, 1. Patrick Willis, San Francisco, 49; Ray Lewis, Baltimore, 13; David Harris, NY Jets, 10; Jon Beason, Carolina, 9; Jonathan Vilma, New Orleans, 7; DeMeco Ryans, Houston, 4; London Fletcher, Washington, 2; Curtis Lofton, Atlanta, 2; D.J. Williams, Denver, 1; Jerod Mayo, New England, 1; Gary Brackett, Indianapolis, 1. Charles Woodson, Green Bay, 48; Darelle Revis, NY Jets, 48; Nnamdi Asomugha, Oakland, 2; Leon Hall, Cincinnati, 1; Asante Samuel, Philadelphia, 1. Darren Sharper, New Orleans, 46; Adrian Wilson, Arizona, 29; Brian Dawkins, Denver 10; Ed Reed, Baltimore, 4; Nick Collins, Green Bay, 4; Jairus Byrd, Buffalo, 3; Bernard Pollard, Houston, 1; Antoine Bethea, Indianapolis, 1; Brandon Meriweather, New England, 1; Tyvon Branch, Oakland, 1. Shane Lechler, Oakland, 48; Donnie Jones, Rams, 1; Andy Lee, San Francisco, 1.
x-two voters selected only one running back. y-one voter selected only one inside linebacker.